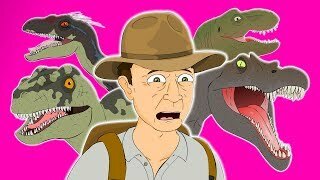 Animated music video parody of the movie "Jurassic Park 3"
Alan Grant and Billy are tricked into visiting to Isla Sorna by Mr and Mrs Kirby where they meet a singing Spinosaurus, a T-Rex, a raptor family, pteranodons, and of course Cooper, a professional who can handle himself ...or so Udesky claimed. Specialize in raptors, the way they hurt. I hate babies, they make me feel insanity. I do it for the cash, but the crowd is rough. No force on earth or heaven could get me to go back. Except money, obviously. Everybody needs money. We need to go kill them all. Snap their necks after they fall. I will fight a T-Rex, wrestle him. Am I hybrid, or natural? Question that I ponder, cause I’m so much stronger, than the rest. Hunting down the humans, cause they hit my huge fin, with their plane. Pop him in the nose for his dishonest decision. Pteranodons turn him into prehistoric chum. He’s hungrier than hell and he’s ready for a slaughter. Then I shoot it with a flare and save the day. They’re trying to run off with our eggs. So we must bite em, so they die. Eric’s lost, Ben’s dead and hanging. You need to stop yelling, can’t you see? When the tricycloplots get ya, don’t come cryin’ to me. Use my giant wings to catch yo b***h a** running. Take Billy with my homies as a sacrifice. Did anyone notice how mr udesky runs at 1:29? 1:24 best part. The music combine with that scene. I love your songs.Do a Jurassic world 3 song when the movie is out!!! What it a name of original músic? Its a parody of way music?? Terrible film, but great musical version! 3:41 who recognizes Owen from Jurassic world on the left? JURRASIC PARK,JURASSIC PARK THE LOST WORLD,JURASSIC PARK 3,JURASSIC WORLD,JURASSIC WORLD FALLEN KINGDOM,JURRASIC WORLD 3. Many people might hate me for this but, if the T-Rex had defeated the Spino I would have hated the movie. I like how you make Spino sound like a Psychotic Maniac. It makes him sound scarier.